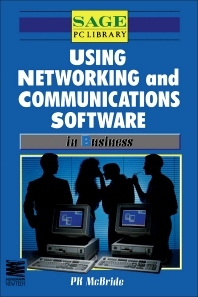 Using Networking and Communications Software in Business covers the importance of networks in a business firm, the benefits of computer communications within a firm, and the cost-benefit in putting up networks in businesses. The book is divided into six parts. Part I looks into the nature and varieties of networks, networking standards, and network software. Part II discusses the planning of a networked system, which includes analyzing the requirements for the network system, the hardware for the network, and network management. The installation of the network system and the network management, which covers password and security, backing up of files, managing the print server, and performing good network practices, are considered in Part III. Part IV describes the application and suitable software that concerns the database management and accounting systems, spreadsheets, and word processing. Communications and on-line services are dealt with in Part V. The last part of the book presents appendices on multi-user alternative, the Data Protection Act, SageNet, Tapestry II, and Product Suppliers for reference. The text is invaluable for computer engineers and people in business firms involved in data and systems management. What Makes up a Network? Chapter 2 Networked or Separate?